We had a very powerful visit to Washington DC. We met with the chiefs of staff for three Representatives and one Senator. We started out with a tour of DC and visited the Lincoln Memorial and the Smithsonian Air and Space Museum. After returning to the hotel for lunch, we attended a session about how the kids need to speak up about their needs. They watched a great presentation and saw a Schoolhouse Rock video about how a bill becomes a law. We were even able to see some practice sessions about how to speak to our members of Congress on Thursday. Sarah Wayne Callies, who played Lori on The Walking Dead played the Congresswoman. Brittany almost jumped out of her skin when she was able to meet her. 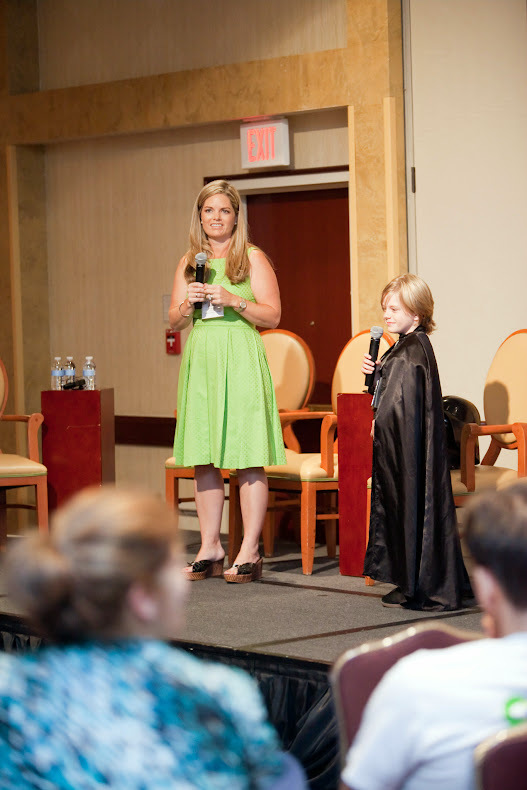 Max, the boy who played Darth Vader in the commercials, came to tell his story. Tori enjoyed talking to him about open heart surgery, something they both have in common. That night, we had a fantastic party to attend. There was a band playing music for the kids. 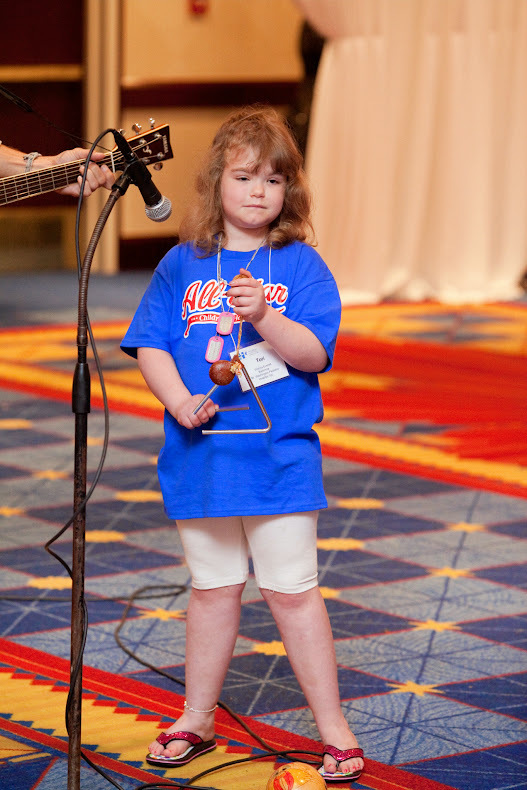 Tori enjoyed dancing and playing instruments with them. The teen area had a basketball game, air hockey and a lounge. Each one of us got at caricature done and the girls had face painting. During the day, the girls had received a gift; Tori received an autographed picture from Selena Gomez, and Brittany received a copy of Katy Perry’s DVD and Katy had signed the DVD case. The girls were so excited with their gifts. Thursday, we were introduced at each office, and then we told our story. We spoke explaining what life was like with one disabled child, and then how it changed even more when we faced yet another medical crisis with Brittany. The circle of care spreadsheet was provided for each chief of staff, showing in detail of the number of doctors, prescriptions, diagnosis, medical equipment, and therapies each girl has. It was something tangible that they could review and then share with their Congressmen. After we spoke, the representatives from the hospital talked about their needs for health care. We were able to explain how wonderful it was when Tori had medical assistance for the year she spent in the hospital. Then we explained how hard it has been financially since we had medical assistance taken away. The government views the parent's income to decide if a child needs assistance, rather than look at the needs of the child, or children in our case. We are in financial crisis trying to deal with the daily care of our children. We have to decide each week if we are going pay the bills, buy groceries, or get medication/medical needs. Our family is on about 30 medications daily, between the five of us. Some are covered with a copayment, up to $30, while others are not covered and cost up to $100. It is extremely expensive to have medically complicated children. And that was our point to the Congressmen. We also spoke about continuity of care, and the timeliness of making appointments with our doctors. Victoria has almost every type of specialist that there is at Mt. Washington and Hopkins. Having doctors all being able to access the information needed for continuity of care is extremely important. Due to the fact that she is so medically complex, doctors need access to her records. Making doctor appointments also should not take months for children like Tori and Britt, or any child. Specialists should be accessible when they are needed and the government should make it easier for doctors to specialize in diverse fields. I managed to get through the day without tearing up. I stayed focused on what I needed to say and get my message heard. So many people need reform to health care, especially for children. I feel like I now have a new mission in life. 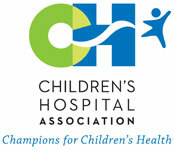 I need to help get health care reform for children like ours and other medically complex children. More people need to reach out to members of Congress around the country so Medicaid will not be cut and the criteria for getting access to help changes, so families like ours can get help. Last year my daughter, Leanna, her Dad, and myself, were asked to attend FAD12 to represent Boston Children's Hospital. I have been thinking about the families participating this year and especially so last week, when I was watching a tribute on TV to the late Massachusetts Governor Paul Cellucci. The Governor died at 65 of ALS (Lou Gehrig's Disease). Governor Cellucci did many wonderful things in his life. Even during his last two years of his illness he raised more than two million dollars and was an advocate for research for ALS. There were many eloquent speeches given about Gov. Cellucci. But one speaker's words really hit home. This speaker was Dr. Michael Collins, Chancellor of The University of Massachusetts medical schools. In his speech he said "He (Cellucci) was aware that government funding of medical research was not keeping pace with inflation. He was worried that cures were being delayed because diminished research funding could not keep stride with the intellect and innovation of those who conducted it." He added, "There isn't one of us who wants to have to face the prospects of a very difficult and challenging disease. There isn't one of us who wants to believe that our nation cannot invest in research so that we can actually find a cure for diseases like ALS." These words made me think of the importance of Family Advocacy Day. Last year, Katie Beckett's mother Julie came to speak to the family advocates about the Katie Beckett Waiver. Mrs. Beckett came to speak to us even though her daughter had just died about two months before the conference. She wanted us to know the importance of what we were here to do in D.C. Because of her advocacy, President Reagan signed the law creating the Katie Beckett Waiver so that all disabled children could receive Medicaid support. This waiver keeps many families intact. Prior to this waiver many children had to be institutionalized for life. During these difficult economic times with rancorous partisan debate over healthcare, what each of you is doing is so important. As we saw with Mrs. Beckett, one voice can make a huge difference. You are a voice for many. Think of Mrs. Beckett, Governor Cellucci, and all the past participants of previous Family Advocacy Days as you embark on this important journey. Our family wishes you good luck with your meetings. Attending Family Advocacy Day was life changing and empowering for Leanna and our family. I know it will be for yours.